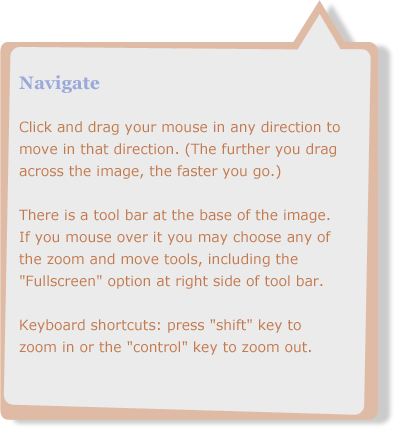 Click and drag your mouse in any direction to move in that direction. (The further you drag across the image, the faster you go.) Mouse over the tool bar at the bottom of the image to choose zoom and move tools (Fullscreen option on right side of tool bar). Keyboard shortcuts: Shift key zooms and Control or Alt keys zoom out. Welcome to a virtual tour of archaeological excavations along the Colorado River in Grand Canyon National Park. These excavations took place between 2007 and 2009. On this tour, you will visit archaeological sites that lay mostly hidden for centuries. Archaeologists excavated the sites, exposing them for a few days or weeks during which time these images were taken. Immediately after excavation, the sites were reburied to protect them from further damage from exposure to the elements and possible damage from visitation. This tour is now the only way to experience these places where people once lived. In all, the National Park Service (NPS) and the Museum of Northern Arizona (MNA) excavated nine archaeological sites along the Colorado River in the Grand Canyon during three years of fieldwork. The NPS/MNA excavation project was the first major archaeological excavation to occur along the river corridor in Grand Canyon in nearly 40 years. The NPS has a “preservation-in-place” mandate, and excavates archaeological sites only when they cannot be stabilized and preserved in place. These sites were disappearing due to erosion; artifacts were literally washing into the river. Because these sites were being lost, the NPS initiated excavations to learn more about the people who lived here before the archaeological evidence of their lives in the canyon was completely gone. Erosion caused by this arroyo exposed part of a prehistoric wall. Efforts to stabilize the erosion with brush check dams were unsuccessful. When archaeologists excavated here, they unearthed a large room. During excavation, archaeologists recovered artifacts such as potsherds and stone tools. They collected soil and charcoal samples from hearths for laboratory analysis. Crews carefully recorded the architectural details of the walls and floors of excavated rooms and storage bins. Artifacts were closely examined in the laboratory so that archaeologists could infer details about the lives of the people who lived here long ago. For example, pottery styles revealed information about time periods of occupation, and possible trading patterns. Burned cotton seeds recovered from an ash sample taken from a hearth at one of the sites yielded the earliest evidence to date for cotton cultivation in Grand Canyon. This kiva was unearthed during the excavation at Palisades. It was only a few feet away from an active arroyo that was eroding other rooms in this site. During the excavations, NPS rangers gave tours to nearly 2,000 river-rafters and backpackers, providing them with an once-in-a-lifetime opportunity to see an excavation in progress in the Grand Canyon. At the conclusion of each dig, the sites were reburied, and the disturbed areas were planted with native vegetation in order to protect them from further erosion. Ranger Allyson Mathis showing river rafters the excavation in progress at Palisades. The NPS hired Tom Bartels of Round House Productions in Durango Colorado to produce this virtual tour which shows the excavation work in progress at four sites. The interactive 360° images at each stop capture a specific moment during the excavation of the site. Each image was taken near the end of the field session, when excavation was nearly complete. The rooms with their walls and floors are evident, having been exposed by crew members who carefully dug and hauled the overlying soil away one bucket at a time. In the photos, you’ll also see archaeologists at work, along with their tools, such as shovels, trowels, screens and buckets. The virtual tour begins at a popular South Rim viewpoint, Lipan Point. Here, you overlook the part of the canyon where the excavations took place. Access the link in the list on right side of this page. After the view from the rim, the tour travels to Hilltop Ruin, an archaeological site located just above the river, providing an inner canyon view of the locations of the excavated sites. The tour then moves to four sites excavated in the NPS/MNA project. The sites may be visited in any order. You can navigate in the 360 degree panoramics by clicking and draggin your mouse or by using the toolbar in the lower part of each image. Click on the red targets to travel to other sites, or use the corresponding list of the links on the right side of page. The blue information targets within each image contain details on various points of interest. Navigation help can be found at the question mark in top right corner of this page. This photo was taken about 18 months after excavation at one of the sites. By backfilling the site and planting native vegetation, archaeologists protect the area from future erosion and return the landscape to its natural condition.